The pedal is designed to simulate the swirling wind and general crappy sound you get listening to bands at festivals, possibly whilst under the influence, and was first imagined by the Super Furry Animals. 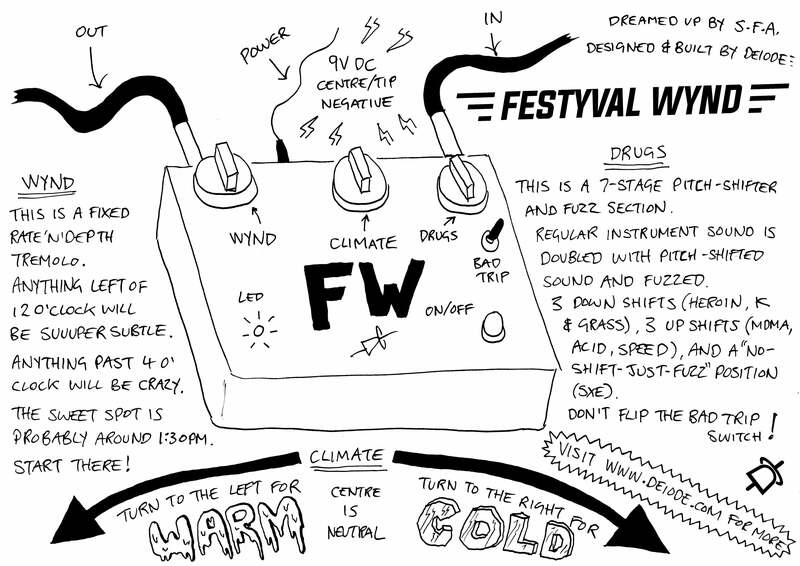 The legendary Festyval Wynd effects pedal, dreamed up by Gruff Rhys and the Super Furry Animals, and now available for you! WYND - A special tremolo section which ties rate and depth together in one control. Let the Festyval Wynd blow your sound around, from a barely noticeable gentle breeze to a barely useable gale force - and some fun positions in between. CLIMATE - This one sweeps the tone all the way from Coachella's golden bassy warmth to Igloofest's glacial icy treble. DRUGS - Under the influence? The drugs section combines low-grade fuzz with a fuzzy pitch-shifter to produce seven distinct tones: 3 down shifts, 3 upshifts and one unshifted position for pure fuzz. BAD TRIP - ? Just don't.